Photograph of the temple in Kashmiri style at Malot, Jhelum District, taken by Joseph David Beglar in the 1870s. This is a view showing a sculptured panel, designed to hold statues, between two pilasters, . 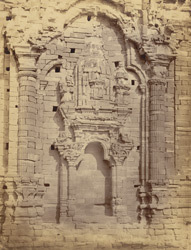 Alexander Cunningham wrote in his report for the Archaeological Survey of India in 1872-3, "The only remains of any antiquity at Mallot are a temple and gateway in the Kashmirian style of architecture. They are built of a coarse sandstone of various shades of ochreous red and yellow, and many parts have suffered severely from the action of the weather, the surface having altogether crumbled away...The temple is a square of 18 feet inside, with a vestibule or entrance porch on the east towards the gateway. On each side of the porch is a round fluted pilaster or half pillar supporting the trefoiled arch of the opening, and on each side of the entrance door there is a smaller pilaster of the same kind with a smaller trefoiled arch...The general effect of this facade is strikingly bold and picturesque."